An electronic speed control or ESC is an electronic circuit with the purpose to vary an electric motor's speed, its direction and possibly also to act as a dynamic brake. ESCs are often used on electrically powered radio controlled models. An ESC can be a stand-alone unit which plugs into the receiver's throttle control channel or incorporated into the receiver itself, as is the case in most toy-grade R/C vehicles. Some R/C manufacturers that install proprietary hobby-grade electronics in their entry-level vehicles, vessels or aircraft use on board electronics that combine the two on a single circuit board. ESCs designed for radio-control airplanes usually contain a few safety features. If the power coming from the battery is insufficient to continue running the electric motor the ESC will reduce or cut off power to the motor while allowing continued use of ailerons, rudder and elevator function. This allows the pilot to retain control of the plane to glide or fly on low power to safety. 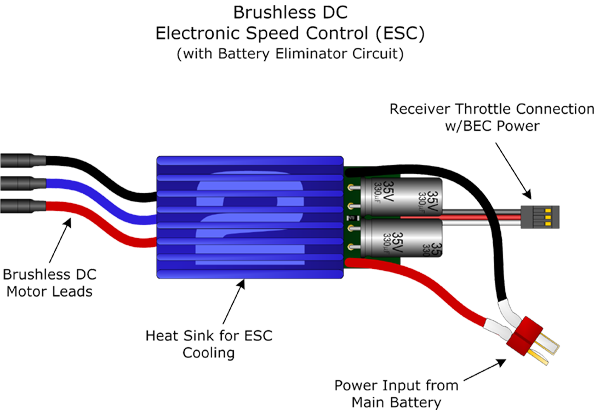 ESCs require adequate cooling. Always mount your ESCs with ample fresh air flowing across the surface and especially the “fins” if your ESCs is equipped with a heat sink. ESCs can get very warm and even hot during use in warm weather. If your ESC is getting too hot and going into thermal protection (acts like voltage cutoff, but with plenty of battery power), try providing better ventilation across the surface of the ESC. If your ESC is adequately cooled and you are still experiencing extreme heat, verify that you are using the right motor/prop setup. The right motor with the wrong prop can draw some serious amps and overheat your motor and ESC. Using a motor with an undersized ESC will also cause extreme heat buildup. Always size your ESC to handle more current than your motor is capable of drawing under normal conditions. There are a lot of things that can happen to a complete radio and power system but the most common issues surrounding ESCs are with arming, voltage cutoff, and motor direction. Arming problems usually involve a disconnected communications cable from the ESC to the receiver, a REVERSED communications cable (plug is flipped at the receiver end), or a throttle that’s not quite set to zero. Check all your connections and connection polarity and also the TRIM on your transmitter THROTTLE channel. Sometimes the trim gets bumped up a tick or two and the throttle isn’t registering at a full stop. The ESC will NOT arm if the throttle is anywhere but zero. This is for safety and also so the ESC understands the full throttle range before use. Some ESCs offer settings called Throttle Input Range that can address incorrect throttle travel. Check the programming if your new ESC just will not arm. Voltage cutoff problems are very common on new setups. Make sure the cell count and cell type is correct or the ESC will go into cutoff on a fully charged pack immediately. If your ESC arms just fine, the motor “idles” fine but cuts out at ¾ or full throttle than you probably have the cell count incorrect. Check the battery pack voltage just to be sure your battery is charged, but also check the programming to verify your cell count. Remember, the beeps at arming should match your cell count. Incorrect motor direction is an easy fix. Just reverse any two wires going to the motor, NOT THE BATTERY! You can’t harm the motor by changing the connection sequence of the three wires going to the brushless motor or two wires going to the brushed motor. Some ESCs can reverse direction in the programming, so before you dig into the wires, check the programming.